Shaun Haynes, with his dog Cam, and Nan Mackenzie. Among the group of local shepherds planning to exploit home advantage at the national sheep dog trial championships later this year is veteran competitor Allen Nisbet. 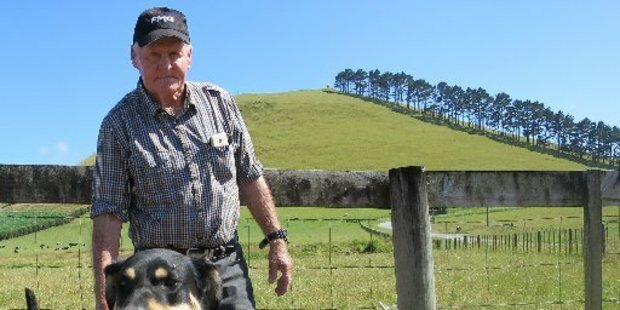 The Mangakahia SDT (Sheep Dog Trial) Club member will mark a half century of trialling this year when the provincial domestic circuit kicks off next month where the focus is on qualifying a number of his dogs for the 2019 Tux North Island and New Zealand Championships which are being held on Mt Te Ahu Ahu, just north of Ohaeawai in May. A holder of several North Island and South Island titles, a national title has eluded Nisbet although he has finished runner up on various occasions in previous years. And at 81, he still didn't expect to be one of the elder statesmen competing at the nats but noting there was a chap from the South Island who had just turned 96 who was likely to make the cut. Asked if the sport was still relevant today, Nisbet believed the differences from when he first began trialling were only slight: "Interest is about the same. It was different, we worked different sheep. They came off big stations, we had big wethers [fixed sheep]. We are working ewes and lambs now [on the domestic Northland circuit]," he said, noting hoggets will be used at this year's nationals because of the time of year. Evergreen sheep dog triallist Allen Nisbet, shown here with his huntaway Heath, is aiming to qualify a number of his dogs for the 2019 Tux North Island and New Zealand Championships being held on Mt Te Ahu Ahu (in the background) in May. 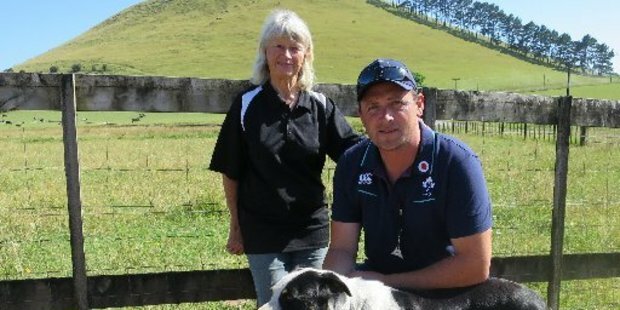 Nisbet also accepted that although the nationals are being held on home turf, the crew representing Northland clubs there will still find themselves up against the odds thanks to the number of sheep farms across the province having steadily declined in recent decades. "We might have to travel more to places to qualify with so little sheep in north. I have got about nine sheep [at home], I train all my dogs on them ... I also get a little bit of outside block work from time to time." Nisbet recalled growing up in the days of A Dog's Show — and, to a later and lesser extent, Tux Wonder Dogs — when it was prime time viewing at 6pm on Sundays, back in the days of three channels, making household names of New Zealand's best sheepdogs and their handlers. While the upcoming nationals have already attracted strong sponsorship from local businesses, Nisbet and his Northland stablemates would be rapt to see people from the wider Far North public there to witness some of the best in the business ply their trade. "We've just got to make it happen. I would love the public come along, it would be great. We have to got to get it out there, get people to come to it." Preparations are well for under way for the Tux North Island and New Zealand Championships sheep dog trial event to be held on Mt Te Ahu Ahu in the Mid North from May 16-20. The event is being hosted by The Northland SDT (Sheep Dog Trial) Centre out of the Bay of Islands SDT Club headquarters on Haruru Rd. Spokesman Shaun Haynes from Okaihau said organisers were expecting a field of over 300 entries from all over the country, including the newly crowned South Island champions, to contest the various North Island and national titles on the line in the heading events of short head and yard, and long head, and the huntaway events of zig zag and straight hunt. "This is a big deal. We are showcasing the Far North," he said, the volcanic cone of Mt Ahu Ahu was the only hill in the northern hemisphere on which all four courses were up to New Zealand standard. The hill is located on a farm owned by the Mackenzie family and was purchased over a century ago under the decree that it be used specifically for the sport of dog trialling. Haynes said he also expected a bigger than normal turnout for the Bay of Islands leg of the Northland series, also at Mt Ahu Ahu, next month with many competitors from outside the Northland centre likely be there in order to get a handle on the hill as part of their build-up to the nationals. * Profiles of Far North shepherds competing at the trial will feature over coming weeks. The domestic Northland circuit begins at Helensville on February 1-2, then heads to the Bay of Islands on February 8-9 (Waitangi Day weekend). Other legs are at Mangakahia from February 15-16, Omamari from February 22-24 (which is being held in conjunction with the annual Northland championships), Rodney from March 9-10, Mt Manaia from March 15-16, Hobson from March 22-23, and Otamatea from March 30-31. The second of two Far North legs in this year's circuit will be held at Broadwood from April 5-6, followed by Molesworth from April 12-13, and Maungakaramea from April 27-28; followed by the 12th and final leg at Mangonui, at Landcorp Rangiputa, from May 3-4. Shepherds competing in the series can earn five points for a win and one point for 5th place, with any dog needing 6 points to qualify for the nationals. For example, a heading dog taking a 1st place in the short head and yard, and a 5th in the long head at any one of the 12 Northland legs qualifies.